Of the 10 largest occupations in the United States, only one - registered nurse - makes more than the national average when it comes to all U.S. jobs. Nurses make $69,790 annually while the average U.S. worker makes $47,230, according to the Bureau of Labor Statistics. The bureau’s Occupational Employment Statistics program provides employment and wage estimates for more than 800 occupations nationwide. More Americans worked as retail salespersons or cashiers in May 2014 than in any other job, accounting for about 6 percent of total U.S. employment. Cashiers at work at Walmart. 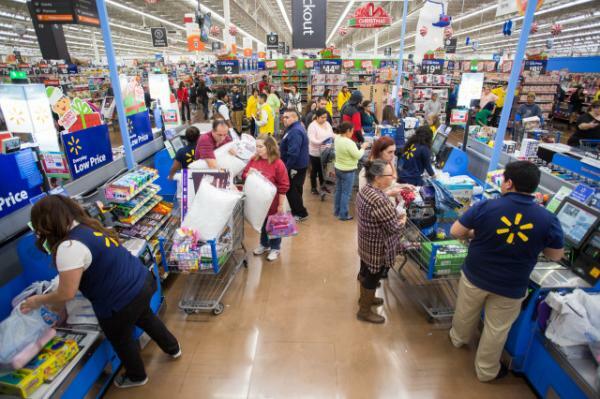 About 3.4 million Americans work as cashiers. The 10 largest occupations include retail salespersons and cashiers, food preparation and serving workers, general office clerks, registered nurses, customer service representatives, and waiters and waitresses. That combined group of workers accounted for 21 percent of total U.S. employment in May 2014. 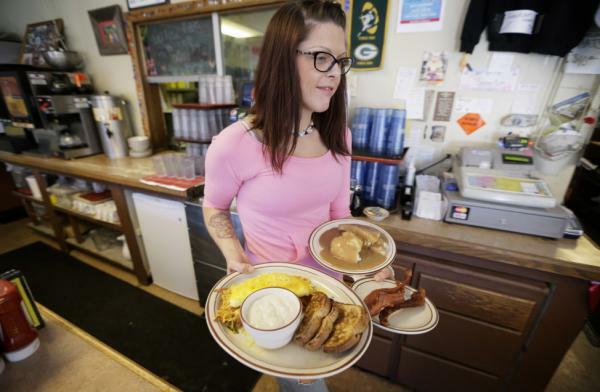 Waitress Laura Haege carries a breakfast to be serve at the Waveland Cafe, June 19, 2015, in Des Moines, Iowa. 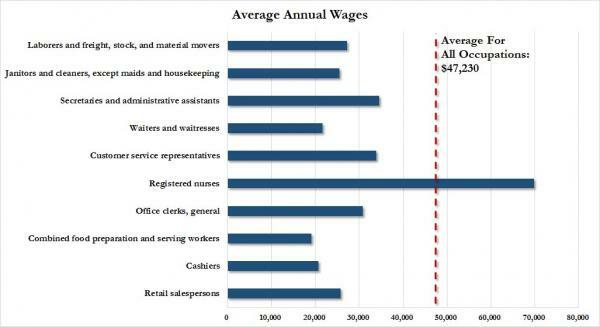 The annual average wages for those largest occupations — excluding nurses — ranged from $19,110 for combined food preparation and serving workers, to $34,500 for secretaries and administrative assistants. Food preparation and serving workers also had one of the lowest paying occupations overall, as did fast food cooks ($19,030), shampooers ($19,480), and dishwashers ($19,540). On the opposite end of the spectrum, the highest paying jobs include certain physicians and dentists, chief executives, nurse anesthetists and petroleum engineers. So-called STEM jobs — occupations requiring science, technology, engineering, or math-related degrees — accounted for about 6.2 percent of all U.S. jobs. There are 100 different occupations that account for the STEM jobs. Seven of the 10 largest STEM occupations were related to computers. Ninety-three of the 100 STEM occupations had mean wages that were significantly above the U.S. jobs average. The highest paying STEM occupations included petroleum engineers ($147,520) and physicists ($117,300). The lowest paying STEM jobs included agricultural and food science technicians ($37,330) and forest and conservation technicians ($37,990). Overall, the most lucrative U.S. jobs included management, legal, and computer and mathematical occupations. The lowest paying included food preparation and serving, personal care and service, and farming, fishing, and forestry occupations. Each had an annual mean wage of about $25,000 or less.